From the time civilization started we have had many that have helped human consciousness to develop and heal with the higher qualities of light. Commander Ashtar was one of those teachers helping with the workings and the development of Atlantis over many centuries, creating and working with the leaders of the Temples and understanding of God’s development of the rays, and how each person is affected by these colours and qualities. Commander Ashtar taught the Atlantian many psychic gifts that are held in the consciousness and cellular memory of humanity today. He is on the board of the inter-galactic counsel and head of the Mother Ship for world protection and integration. He is stopping the dark from other extra-terrestrial beings from affecting us if they do not have good intention towards humanity. He holds the mother ship as a gateway to universal love, allowing through the ET’s who are helping with the higher intent, by channeling to those spiritual light workers who receive messages. 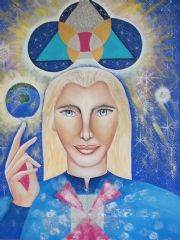 In the painting Commander Ashtar is directly looking at you with his openness to receive and give you knowledge. His hand holding the light of love and his finger pointing to the world, as his intent is to be present and ever watching the enlightenment of our planet. Above him is the cosmic gateway and on his chest are geometric symbols opening universal Love.